Macrofossil data from 73 sites dating to the south Swedish Iron Age (500 b.c.–a.d. 1100) have been compiled and analyzed in order to elucidate long term changes in cereal cultivation. The analyses indicate that “permanent field” agriculture was established at the end of the Bronze Age utilizing Hordeum vulgare var vulgare as a primary crop and Triticum aestivum ssp vulgare/compactum, Triticum spelta/dicoccum/monococcum, Avena sativa and Secale cereale as secondary crops. An observed change towards the end of Roman Iron Age (1–a.d. 400) is the expansion of Secale cereale and Avena sativa cultivation. Evidence also suggests that winter sowing of the former commenced at the latest during the eighth, ninth and tenth centuries a.d. The introduction of winter sowing possibly coincided with the establishment of crop rotation agriculture. During most of the Iron Age southern Sweden displays significant regional variations with regards to cereal cultivation practice. 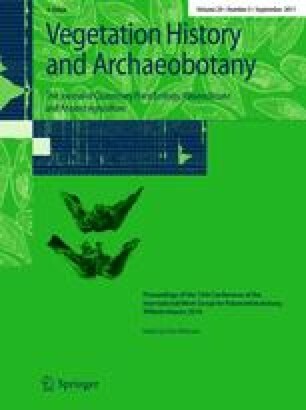 There is however evidence that a more homogenous agriculture appeared across the investigated area from the beginning of the Viking Age (a.d. 800–1100) onwards. The online version of this article (doi: 10.1007/s00334-011-0283-5) contains supplementary material, which is available to authorized users. Many people have contributed to the successful compilation of the material presented in this article as well as the composition of the text itself. For assistance in the process of collecting the material I would like to thank the following people; Roger Engelmark (Umeå University), Tony Björk (Kristianstad County Museum), Hampus Cinthio (Lund Historical Museum), Per Lagerås (UV-syd), Björn Gedda (UV-syd and Björn Gedda Arkeobotanik), Mats Regnell and Ann-Marie Hansson (Stockholm University), Per Sarnäs (Sydsvensk Arkeologi), and Stefan Gustafsson. Thanks also to my supervisors Karin Viklund (Umeå University) and Peter Hambro Mikkelsen (Moesgård Museum, Århus) for guidance throughout the analysis and writing process and also to Renée Enevold and Peter Mose Jensen (Moesgård Museum, Århus) together with Philip Buckland (Umeå University) for their helpful comments and suggestions. Finally great thanks go to Fiona Prendeville for the important task of proofreading and correcting my English.